CIGARBQUE is an intimate evening of fine cigars and food prepared by some of the country's best chefs. This outdoor event features amazing food, wine, beer, creative cocktails and cigars. It all began when Executive Chefs Rick Gresh and Cleetus Friedman decided to meld together their passions for fine foods, entertainment and premium cigars to host a unique charity event. 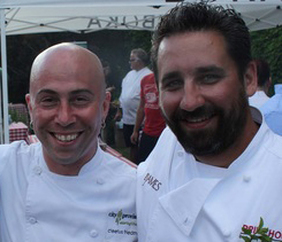 The first CigarBQue Chicago in 2012 was such a success, every participating chef agreed to come back for the 2013 event in less than 24 hours and the event has only grown in popularity. In 2015, after three years of a successful partnership in the Chicago area, the CigarBQue concept expanded nationwide so people across the country can enjoy an outstanding culinary experience in a relaxed atmosphere. We are currently working on this years line up for Chicago, stay tuned for more info! Chef Roger Herring preps his dish for CigarBQue 2014. An overview of what CigarBQue is all about.